Go-Pods.co.uk. Micro Tourer Caravans. Small 2 berth caravans. Teardrop Caravans. Mini Caravans. Best smal caravan. Glamping. Pod Caravans. Teardrop Trailer Tent. Going II Cockpit S caravan. Get Away With Go-Pods . . .
Go-Pods are the perfect blend between camping & caravanning. 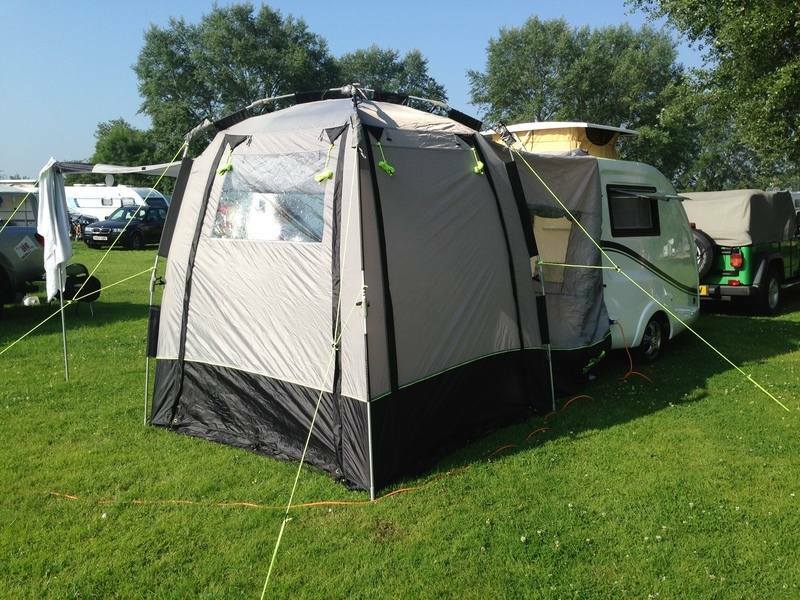 Do you enjoy camping in tents but feel that it’s time for a little more comfort? Go-Pods offer a convenient option that’s still great fun but far more comfortable! With a generous seating area that converts to a king size, 4” thick memory foam mattress and your cooking facilities inside, it doesn’t matter what the weather brings. Minimal set up means that even overnight breaks are feasible, just wind down the two rear stabiliser legs & relax. It doesn’t matter how windy it gets when setting up or even if it’s raining when it’s time to go home. And with the built in blackout blinds, you’ll not be awoken too early either. Rainy days will happen but that’s no problem either when you can get nice & cosy inside your well insulated Go-Pod, with a movie on the TV, a hot drink or a chilled bottle of wine. Perhaps you fancy a motorhome or camper van? They are nice but around 40% of our customers are downsizing from them. The main regret we hear, is not having a car to use when you’re away, so even getting a few supplies means breaking down your entire camp and driving a sizeable vehicle to the shops. Add to this that they come with considerable running expenses, low bridge & car park height restrictions, possible storage & home security issues and that the devaluation in year-one could be more than the total cost of your Go-Pod, to see why they start looking less attractive. Go-Pods provide a solid, full size comfortable bed, (not the lumpy 'rock and roll' type), and the freedom to explore your surroundings at a fraction of the cost. Consider a regular caravan perhaps? With regular 2 berth caravans costing up to £23,000 or more, the Go-Pods pricing offers great value in comparison. But best of all, Go-Pods have a robust, one-piece GRP shell which completely eliminates the risk of seam leaks. Go-Pods store easily and are light too, plus they’re braked for maximum control when towing. And Go-Pods are designed not to snake or wobble, so great for first time towers. But you don’t like towing right? The Go-Pods anti-snaking design means they’re extremely steady & easy to tow, even with small-engined cars. No special driving skills are required & they’re easier to manoeuvre when unhitched than larger, heavier caravans. They’re the ideal for first time towers and a popular choice with single ladies & gents of all ages. You’ll likely not even need to change your car either. And because there are no extension mirrors to attach and no stuff to load, you’ll be more spontaneous - just leave you’re Go-Pod packed ready like a suitcase, hitch up and go! Maybe even really get away from it all by visiting the more remote camp sites, that larger caravans & motorhomes can’t access. Go-Pods - Made for convenience & yet still different enough to bring fun & adventure to every trip. Designed for the UK's weather & making great financial sense. Book a viewing today - click here. Go-Pods feature a comprehensive package of top notch creature comforts, to make your camping trips more enjoyable, while still being different enough from being at home to bring fun & adventure to every trip. 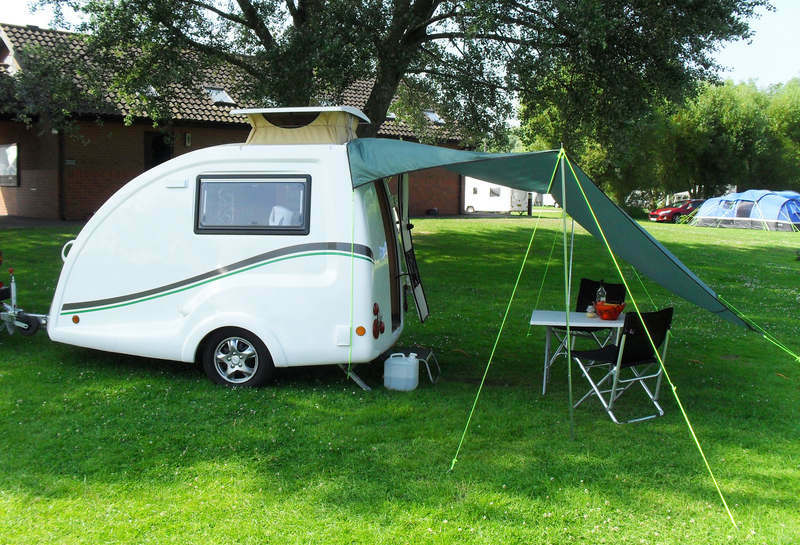 Go-Pods are designed to work with the UK's weather - unlike teardrop trailers that were developed specifically for warmer, dryer climates. Go-Pods have a full size seating area & table - perfect for that rainy day! Sit in comfort on the wrap around seating, (seats 4 adults), & enjoy a meal at the table while watching your favourite movie on the optional flatscreen TV. Go-Pods cooking facilities are conveniently located inside, (not externally like teardrop caravans), combatting poor weather & extending your camping season too. Go-Pods have excellent build quality & a comprehensive 12 month warranty. Go-Pods hold their re-sale value extremely well. Go-Pods are the best lightweight caravans. Easy to tow even with small cars and easier to manoeuvre unhitched than larger, heavier regular caravans. Just 'hitch & go' at a moment's notice! Go-Pods are easily stored. They fit inside most garages & smaller gardens - helping avoid storage fees. Go-Pods can access those more remote sites, that larger conventional caravans & motorhomes can't reach. Go-Pods are made with a one piece, moulded GRP shell, that totally eliminates the risk of seams leaking. Go-Pods can be packed away whatever the weather when your heading home - unlike trailer tents that need to be dry. 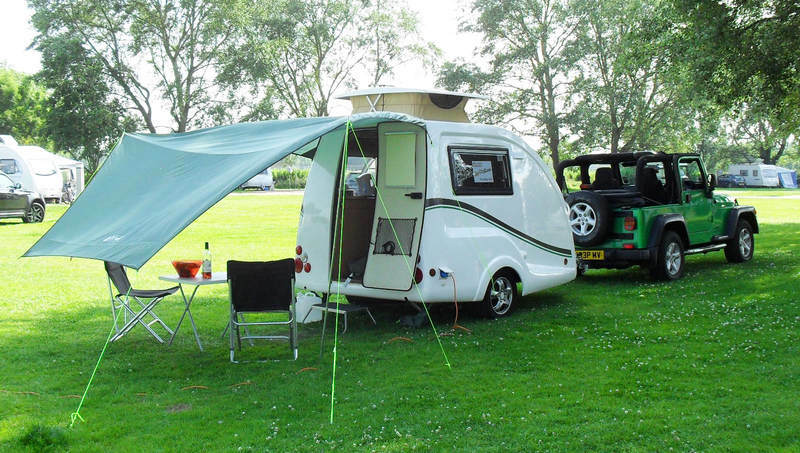 Go-Pods allow your base to be left set up when using the car - unlike motorhomes & camper vans. Go-Pods are surprisingly spacious & appear bigger on the inside! Go-Pods have everything conveniently to hand, so you don't have to brave the elements to make the morning coffee! Go-Pods outstanding design, makes this compact micro-tourer caravan modern, comfortable and practical. We believe that our Go-Pods micro-tourer caravan is the best small caravan on the market today. The build quality of this compact, lightweight caravan is excellent & durable. While the package of feature that's included as standard & the way that they hold their value is unrivalled! To see more videos - click here. Go-Pods the small 2 berth caravans, micro tourer caravans. Lightweight caravans that are easy to tow caravans. Tiny caravans. Similar in size to teardrop caravans but with more convenience. Our pod caravans are little caravans that have 2 berths. Mini caravans that are like many other makes but at a fraction of the price. The going cockpit S is a Go-Pod and appeals to freedom seekers and caravanners. Also of other teardrop style camping pods. A caravan but with a higher spec and superior build quality. Best small caravans. Go-Pods 2 berth caravan was formerly kown as the Cockpit S.